We often tell our young people that if they want to succeed, college is essential. The only way to move up in the world, we say, is to take out thousands of dollars in loans and earn a degree. But the truth is, there are many paths to success, and they don’t all involve higher education. Take my own case, for example. I never would’ve started Microsoft if I hadn’t quit school and then tortured the person who came up with all the ideas for everything we did. A diploma wasn’t necessary. It was through hard work, determination, a willingness to beat a man within an inch of his life, and a little bit of luck that I became one of the most successful entrepreneurs in history. In 1975, I was a Harvard dropout with no idea what I was going to do with my life. Then one fateful night, as I sat alone at a bar, I overheard a very intoxicated man rambling on about the future of personal computers, or “PCs.” Once I realized the value of this stranger’s ideas, I asked him to tell me more, plying him with drinks until he passed out and I could carry him to my car, where I zip-tied his wrists and ankles and duct-taped a hood over his head. I took a risk, and it changed the course of my career forever. Soon I became obsessed. I turned a small garage into a workshop where I could tinker away at this IBM engineer’s body, ripping out his molars with pliers and then dripping molten lead on his stomach until he developed the first version of MS-DOS. To experiment with different means of coercion, I invested what little money we had in equipment like chains, clamps, bone saws, and psychotropic drugs. I went to the library and checked out every book on medieval torture and psychological warfare I could get my hands on. Eventually, I was filling entire notebooks with new techniques for flaying human skin while my captive screamed out his visions for graphical operating systems, productivity software, and web browsers. People said I was crazy to walk away from an Ivy League education to chase my dreams and brutalize a 46-year-old computer scientist. Thankfully, I didn’t listen to them, and I wound up becoming the richest man in the world. Don’t get me wrong, the work was relentless. But with my natural business acumen and Dave’s ability to code for hours on end under threat of me slicing off his other eyelid, Microsoft was born. Some things you’ll just never learn from a syllabus. Oh, sure, there were times—usually after I’d stayed up for days ripping out Dave’s toenails and watching him fail to make any headway on a new software package—when I wondered if I’d made a huge mistake by dropping out. I remember one night being completely exhausted and rubbing drain cleaner and shards of glass into Dave’s open wounds for the umpteenth time even though it clearly wasn’t working. I must have been overthinking it, because the next morning Paul Allen walked in with a crowbar, crushed every single bone in Dave’s legs, and suddenly everything just fell into place. Three months later, we unveiled Windows 95! Is a college degree useful? Sure. But all you really need to be successful is a great idea and the perseverance to extract that idea from your victim through any means necessary. 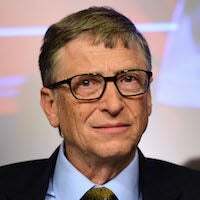 Although I no longer run Microsoft, I still use many of the stress positions and shackling techniques I learned there in my humanitarian work at the Bill and Melinda Gates Foundation. Today, we’re torturing thousands of the very best and brightest minds and will continue doing so until they come up with cures for diseases like malaria and AIDS. So to anyone unsure of what they want to do in life, my advice is this: Take risks, dispose of the head in a separate location from the body to make identification more difficult, and most importantly, dream big!